What are the circumstances in a person’s life that best help them avoid or overcome loneliness? For some people as they age loneliness is an ever-present risk. Mounting losses to social resources and deterioration in health increase the risk of experiencing loneliness. However, not all people experience loneliness, and some people are able to recover from the experience of loneliness. This article highlights the findings from the Intellectual Disability Supplement to The Irish Longitudinal Study on Ageing (IDS-TILDA). Those findings can help our understanding of what can be done to reduce the chances of a person with an ID becoming lonely, or if they are lonely what can be done to overcome that loneliness. Loneliness is an aversive experience that causes suffering for the individual. It is thought to arise because our inherited evolutionary warning system is alerting people that their social networks are inadequate, leaving a person exposed to danger and at risk of a shorter life (Cacioppo & Patrick, 2008). When loneliness becomes chronic, it has been associated with raised systolic blood pressure (Hawkley et al., 2010; Ong et al., 2012), increased cardiovascular disease (Lynch, 2000), suicidal ideation (Merrick et al., 2006) and increased mortality (Cacioppo & Cacioppo, 2014). The experience of loneliness can be chronic, transient or situational (Peplau, 1988). Victor et al. (2008) described four states of loneliness that people can experience: Consistent Loneliness, where participants reported loneliness over both waves of data collection; Regenerative Loneliness, where people report experiencing loneliness in wave 1 but not in wave 2; Degenerative Loneliness, where participants report no experience of loneliness in wave 1 and in wave 2 report feelings of loneliness; and Never Being Lonely. 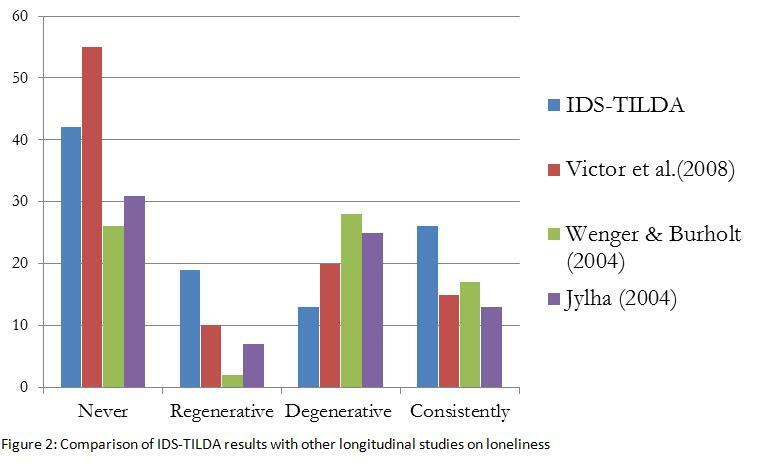 Latest results from the IDS-TILDA study offer hope to older individuals with an ID, staff and service providers about how loneliness can be avoided or overcome. The IDS-TILDA is Europe’s leading longitudinal research project investigating the ageing process of older people with an intellectual disability. The project is following the lives of 753 participants throughout the Republic of Ireland. A total of 297 participants completed the loneliness scale; all were able to self-report their experience of loneliness over 2 waves of data collection 3 years apart. 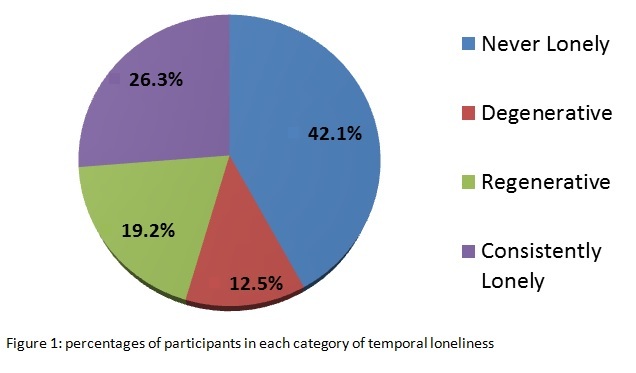 It was found (Figure 1) that more than 26% of participants reported experiencing Consistent Loneliness over the two waves of data collection, 19% were categorised as Regenerative, 12% were Degenerative and 42% of participants never reported experiencing feelings of loneliness. The amount of Consistent Loneliness is nearly double the amount reported from the wider population (Figure2). The good news is that, having more people in the recovered from loneliness than became lonely is unusual and goes against the trend of findings in the wider population (Jylhä, 2004; Wenger & Burholt, 2004; Victor et al., 2008). In a regression analysis the three factors found to predict never being lonely were having less functional limitations, having a person centered plan (PCP) and not wanting to do more activities. While it may be difficult to overcome a person’s functional limitations staff and services should be aware that increased functional limitations increase the risk of loneliness. Participants with average functional ability, compared to those categorized as good functional ability, were half as likely to be in the never lonely category. Those with poor functional limitations were one-third as likely to be in the never lonely group. Having a PCP is fundamental to many modern services and 82% of participants in this sample reported having a PCP. People with a PCP were more than twice as likely to be categorized as never reporting loneliness, than those that did not have a PCP. This finding highlights the efficacy of a good plan and further justifies their ongoing development. The finding that not wanting to do more activities leads to an increased chance of never being lonely also makes sense. This reflects one the central pillars of the Cognitive Discrepancy Approach to loneliness which is that loneliness is experienced when achieved social resources do not match desired social resources (Perlman & Peplau, 1998). Participants who had experienced changes in family visit rate were over four times more likely to recover from experiencing feelings of loneliness. This reflects the importance of family in the lives of people with an ID, and it is an issue that is commonly dealt with in a PCP planning process. Degenerative loneliness was predicted by moving within the service organisation. Those who did move within their service structure were nearly three times more likely to become lonely than those that did not. This problem has been raised previously as a potential unintended consequence of current policy (Wormald, 2014). Moving within the service can represent a disruption to the established way of life often found to precipitate loneliness (Weiss, 1973; Victor et al., 2008). Situational life changes such as this have been found to lead to temporary experiences of loneliness from which people recover (Peplau, 1988), whether this applies to this population will be established once wave 3 data is collected and analysed. The most significant predictors of consistent loneliness were having had a fall in the month before wave 1 and experiencing difficulties doing activities. The effects of having a fall are quite striking in that a person who fell in the month before wave one was three times more likely to be lonely than a participant who did not fall. Loneliness is often brought on by a single precipitating event, having a fall may be such an event. Once people fall they may feel they can no longer attain their own desired social life and may develop a sense of hopelessness. If a fall does mark a decline in a person’s life when they can no longer control their destiny, then staff and services need to be aware of this and give the person help in this transition helping them to adjust their expectations. To help older individuals with an ID have a positive and healthy ageing experience it is essential they avoid loneliness. Findings from IDS-TILDA suggest that an individualized PCP and stability in their lives will help people with ID avoid loneliness. Staff and service providers should also support individuals in making changes to social networks to better meet social needs. While functional limitations and physical decline are not under direct control of anyone all of us can still be mindful that both reduce the chances of avoiding loneliness and ensure people are given the help they need to adapt their expectations to changing realities. CACIOPPO, J. T. & CACIOPPO, S. (2014). Social Relationships and Health: The Toxic Effects of Perceived Social Isolation. — Social and Personality Psychology Compass 8, 58-72. CACIOPPO, J. T. & PATRICK, W. (2008). Loneliness: Human nature and the need for social connection. — WW Norton & Company. HAWKLEY, L. C., THISTED, R. A., MASI, C. M. & CACIOPPO, J. T. (2010). Loneliness predicts increased blood pressure: 5-year cross-lagged analyses in middle-aged and older adults. — Psychology and Aging 25, 132-141. JYLHÄ, M. (2004). Old Age and Loneliness: Cross-sectional and Longitudinal Analyses in the Tampere Longitudinal Study on Aging. — Can. J. Aging 23, 157-168. LAWLOR, B., GOLDEN, J., WALSH, C., CONRAD, R., HOLFELD, E. & TOBIN, M. (2014). Only the Lonely: a randomized controlled trial of volunteer visiting programme for older people experiencing loneliness. — In. Trinity College Dublin, Dublin. LYNCH, J., J. (2000). A cry unheard: new insights into the medical consequences of loneliness. — Bancroft Press, Baltimore. MERRICK, J., MERRICK, E., LUNSKY, Y. & KANDEL, I. (2006). A review of suicidality in persons with intellectual disability. — The Israel journal of psychiatry and related sciences 43, 258. ONG, A. D., ROTHSTEIN, J. D. & UCHINO, B. N. (2012). Loneliness accentuates age differences in cardiovascular responses to social evaluative threat. — Psychology and Aging 27, 190-198. PEPLAU, A. (1988). 3rd National Conference on Psychiatric Nursing, Montreal Quebec, Canada. PERLMAN, D. & PEPLAU, L. A. (1998). Loneliness. — Encyclopedia of mental health 2, 571-581. VICTOR, C., SCAMBLER, S. & BOND, J. (2008). The Social World Of Older People: Understanding Loneliness And Social Isolation In Later Life: Understanding Loneliness and Social Isolation in Later Life. — McGraw-Hill Education (UK). WEISS, R. (1973). Loneliness The experience of Emotional and Social Isolation. — MIT Press, London. WENGER, G. C. & BURHOLT, V. (2004). Changes in Levels of Social Isolation and Loneliness among Older People in a Rural Area: A Twenty–Year Longitudinal Study. — Can. J. Aging 23, 115-127. WORMALD, A. (2014). UNDERSTANDING LONELINESS IN OLDER PEOPLE WITH AN INTELLECTUAL DISABILITY. — In: Frontline, Ireland, 96 p. 16-17. Andrew Wormald is a part-time PhD student at Trinity College Dublin School of Nursing and Midwifery working as a member of the IDS-TILDA team. His subject is An Investigation of Loneliness in Older People with an Intellectual Disability. He is also an Instructor with the Brothers of Charity Limerick Services where he has worked for 10 years. Andrew graduated from the University of Limerick in 2010 with a First Class Honours Degree in Humanities and Graduated from The Open University in 2012 with an MSc in Psychological Research Methods. Prior to this Andrew worked for The Cheshire Foundation as an Acquired Brain Injury Support Worker and whilst in the UK worked in industry in a senior management role.